Its time again to get the BlogPoll up and going. The poll will make its debut for the season on Monday and we’ve been asked to put our preseason top 25 out there for public scrutiny. Here’s how I’m thinking that the whole thing should shake out but what I really want to here is how you feel about it. Share, share and share! 1. 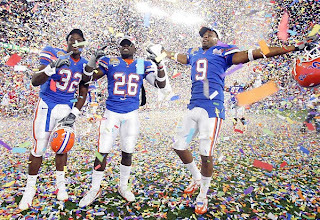 Florida – Defending national champs and should remain #1 until someone knocks them off. 2. Texas – The Longhorns didn’t get shafted last year. They actually controlled their own destiny until they lost to Tech. There isn’t a system to blame for that but the name Blake Gideon should perk some ears up. 3. Oklahoma – Could have the best defense in the nation and make the climb to #1 if the new offensive line allows the offense to hum. 4. Alabama – The Tide return 9 starters from last year’s defense but have to find 7 new guys to produce on offense. 5. Virginia Tech – With Tyrod Taylor and 7 other returning starters on offense the Hokies are the frontrunners to win the ACC. Tech also returns 7 starters on defense. 6. USC – The Trojans are talented at every offensive skill position and unproven at quarterback. They are also replacing 8 starters on defense. The good news though is that they play in the Pac-10. 7. Ohio State – Terrelle Pryor has three returning offensive linemen to develop a core for the offense but he must break in new players at receiver and running back. 8. Penn State – Penn State has to replace a total of 14 starters between their offensive and defensive units but shouldn’t face a true test until October 3rd when they travel to Illinois which is plenty of time for the new guys to gel together. 9. Mississippi – Jevan Snead could be the best quarterback in the SEC not named Tebow and even then the only thing that separates the two is Snead’s inability to walk on water. 11. California – Jahvid Best could be the best running back in the Pac-10 and a defense that returns 8 starters shouldn’t be too shabby. The Bears also get USC at home on October 3rd. 12. Oklahoma State – The Cowboys are the new kids on the block when it comes to Big 12 powers but they’re going to need to show that they can play defense before anyone places them ahead of Oklahoma and Texas. 13. Georgia – A new quarterback and a new running back are two of the Bulldogs’ biggest obstacles but they do return four of five starting offensive linemen. Opening the season at Oklahoma State gives Georgia the perfect opportunity to get everyone talking about them. 14. Oregon – The Ducks are looking to play third fiddle in the Pac-10 but with both Cal and USC coming to Eugene they will have all the opportunities needed to make a run for the Rose Bowl. 15. Georgia Tech – With 9 returning starters on offense the Yellow Jackets are primed to make a run at the ACC title in Coach Paul Johnson’s second year. 16. Boise State – The schedule doesn’t look good for the Broncos. As the season opener against Oregon looms they must find support for second year starting quarterback Kellen Moore. 17. Utah – With 8 new offensive starters (including every skill position) the Utes will have their work cut out for them to come close to last year’s historic run. The good news is that they return the core nucleus of their defense. 18. Florida State – Quarterback Christian Ponder returns along with tight end Caz Piurowski and the entire offensive line. The Seminoles have always seemed to find producers at the skill positions. 19. North Carolina – Seven returning starters on offense and nine on defense have the Tar Heels thinking ACC Championship. They do have to take a Virginia Tech on the 29th of October. 20. Iowa – The Hawkeyes return 14 starters but have a schedule that takes them on the road to Penn State, Wisconsin, Michigan State and Ohio State. 21. Nebraska – The Huskers will be led in `09 by Ndamukong Suh and the resurgent Black Shirt Defense but only four returning starters on offense could be an issue in a conference where offense is king. 22. BYU – As crazy as it sounds the Cougars may have to rely on defense initially until the seven new offensive starters, including four linemen and all receivers, have a chance to get their feet wet. It’ll be a baptism by fire though with Oklahoma and Florida State being two of their first three opponents. 23. Oregon State – Jacquizz & James Rogers helped carry this team to 9 wins in `08. They’ll need a little more support in `09 to get the Beavers to the top of the Pac-10. 24. Kansas – If the Jayhawks don’t represent the North in the Big 12 Championship then they’ll have no one but themselves to blame with 15 returning starters from last year’s squad. They get Oklahoma at home but will have to face off against the Longhorns in Austin. 25. Michigan State – The Big 10 is getting a lot of love in my preseason poll and if the Spartans can get production from a new quarterback then they could be one of the surprises of the Big 10.